I made a new disc template with a smaller hole in the middle to better fit my work. I was going to do another disc and it's gone. Now when I open my older disc work which I saved, the discs are in the original start template (cd/dvd disc label - generic) and my custom made is gone! Re: My template is lost!! When you create a "New" custom template in AudioLabel, there is a "Name" textbox at the top left where you can set a custom name. Do you know what you named the template, and is that name still in the template list? 1. 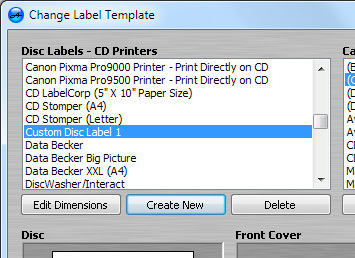 Clicking the "Delete" button in the "Change Label Template" dialog. 2. Uninstalling, and then re-installing AudioLabel. There is really no way to recover a deleted template. However, templates are easy to create. What is the brand/model of your label paper, or ink jet printable disc? We could look up the inner diameter dimensions here for you. I have canon ip 7250 which is in list with print directly on disc feature.